‘Tis the season for lots of parties, indulgent meals, and forgiving outfits. If you want to enjoy the flavors and festivities this year, but don't want to sabotage all your hard work, keep reading. I'm going to share with you three of my favorite simple, healthy, full-of-flavor roasted recipes that will wow your guests, and maintain your waistline. Keep it low. You want the temp around 400 degrees. The higher the oven temperature, the more nutrients you'll lose from your precious veggies. Keep it simple. Roasting will bring out the natural sugars of the veggies, making them extra delicious. All you need is some salt, pepper, and maybe some herbs that accentuate the flavors. Keep it light. You don't need tons of butter or oil when you roast. I like to use a coconut oil cooking spray to insure nothing sticks to the pan. The natural juices will come up, keeping the veggies moist. Keep it covered. You don't want to dry out your veggies. I place foil or parchment paper over the top of the baking dish to make sure everything stays nice and juicy. Roast Brussels sprouts at 400 degrees for 20-25 minutes, until they start to get crispy (sometimes, I finish these off in the broiler for extra crunchiness). When the Brussels have been in the oven for about 10 minutes, combine the chopped apple and shallots in another baking dish. Cover and bake for 10-15 minutes, or until they become soft, but not mushy. When everything is cooked, place it atop a bed of spinach or preferred leafy green, and drizzle with dressing. If you like extra crunch, you can sprinkle with some toasted pumpkin seeds. Place squash face up in a shallow baking dish, drizzle with oil, salt, and pepper, and cover with foil or parchment paper. Bake at 400 degrees for 45-50 minutes, or until soft. Put apple, shallots, and thyme in another baking dish, cover and bake at 400 degrees for 20-25 minutes, or until soft. In a large pot, scoop the cooled, roasted squash out of its skin and into the pot. Add in the roasted apple, shallot, and thyme. 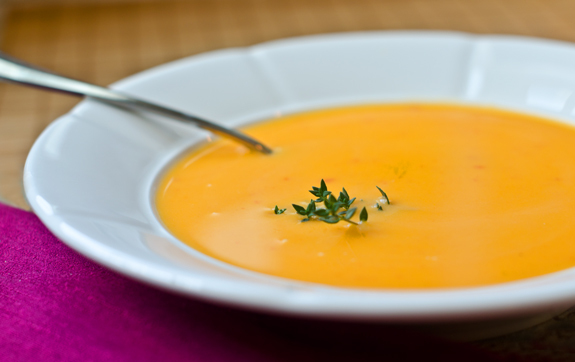 Pour in 1 cup of vegetable stock at a time, using a hand blender to puree the ingredients. Keep adding stock until desired consistency. Then, heat soup and enjoy! If you don't have a hand blender, place all ingredients into a food processor or high-powered blender to combine. Then transfer to a pot to heat and enjoy. Place chopped sweet potatoes/yams evenly in a baking dish. In a small bowl, combine chopped rosemary, sugar, and salt. Drizzle oil, and rosemary mix over the sweet potatoes. Toss until sweet potatoes are covered with rosemary. Cover the baking dish with foil or parchment paper, and roast for 25-35 minutes, or until sweet potatoes are soft. *Japanese sweet potatoes are my personal favorite in the winter. They have just the perfect amount of delicate sweetness, without being overpowering. Often, I'll simply roast them whole, and enjoy as a side with my dinner. So easy and delicious!